7 reasons to install a solar power system on your roof - Florida Power Services "The Solar Power Company"
If you landed here, you probably know that solar energy is the power provided by the sun. It is sustained through a technology called photovoltaic (PV) cells – turning sunlight directly into electricity. Homeowners and business owners around the nation are installing solar panel systems on their roofs to take advantage of this clean and renewable way to generate power. Are you not sure if you should go solar and how it would benefit you? Take a look at the top 7 reasons why you should switch from traditional electricity to solar power. Contrary to conventional power, sun-based power delivers no harmful emissions that hurt the planet. It’s a clean and inexhaustible process that uses the most natural of all assets: the sun. Let’s say you have a shingle roof one story home with average utility power bill of $167 a month. $167 x 12 = $2004 a year for utility power, over the course of 25 years (if rates stay the same) you’ll be giving away $50,100 to the utility company. However, electric rates have increased an average of 6.7% a year for the last 15 years (So it’ll be even more). If you buy your own solar panel, you would pay $28,000 – $8,400 (Fed Tax Credit) = $19,600 in net cost. You’d stop paying electrical bills and 25 years from now, by going solar, you will have saved over $30,000. Grandma loves her flowers, and we love grandma! Global warming threatens the survival not only of human society, but also, the survival of countless species. Fortunately, there is now an efficient way to create electricity without producing global warming pollution: solar panel systems! Electricity from utility providers is never guaranteed a set price. The price may rise or fall, and without any other option, consumers have to pay whatever the current price is. However, the cost of a solar system remains the same throughout time. When you decide to finance your solar system, you set a minimal monthly payment that replaces your electricity bill. If you fully purchase your panels, from then on your energy cost becomes $0. That’s right! – $0. Flash news: the sun is not going anywhere. Luckily, we are not running out of sunshine nor is it hard to find. Alternatively, fossil fuels are a depleting resource and we need to keep finding more if we want to keep using it. One of the many myths about solar power involves perceived limitations on the energy-generating potential of solar panels. However, it is important to say that solar energy is generated from daylight and not sunlight. So, your panels will be working to produce energy even on cloudy days. The energy produced during daylight is stored the whole time that the sun is up, producing more electricity than you actually are capable of using. Any excess energy is pushed back onto the grid, actually causing your utility meter to spin backward, crediting your account with the extra energy generated. Then, in the evening hours, you will be using the credited energy from the meter. Sometimes, the home improvements that you make to your house won’t add quite the equal value to your house as the money that you put into them. Unless you’re talking about solar energy. Then, you will not only save money from your energy bill each month, but also the investment made in the solar system, will add property value to your home. Solar panels can even be the difference in selling your house because it is an added value that gives potential buyers a reason to consider your house over others. 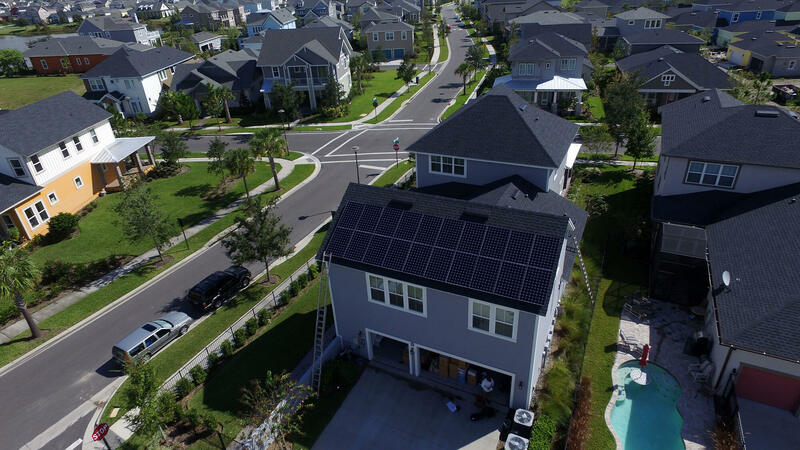 Additionally, in Florida, you receive a property tax exemption that excludes the added value of a solar panel system from being considered in the valuation of a property for taxation purposes. We highly recommend to buy your solar system – we provide you with the right financing. This is because leasing the solar system removes your eligibility for the tax credit. Additionally, when you lease, you lose the valuable savings to the leasing company. Solar panels are resistant and have no moving parts. It’s quite difficult for a solar panel to be damaged and for it to be an interruption in service because they are exhaustively tested to ensure that they can withstand high winds and extreme weather conditions. Even if something occurs to your solar panels, most systems come with a 20–30 years of Solar World warranty. Additionally, Florida Power Services provides with a 5-year installation warranty, online monitoring and flashings to protect against water intrusion. Click here to get a quote and start saving!